Think about all the tasks you do that require technology: online banking; using social media; a smartphone; an EFTPOS machine; an ATM. These technologies are largely inaccessible to persons with disabilities. an audio safety announcement that is uncaptioned, so cannot be understood by a person who is deaf. Inaccessibility prevents hundreds of thousands of Australians from interacting with technology and using it to its full potential. Why isn't digital technology regulated by basic standards like those for accessibility ramps in buildings? Digital Gap Initiative is a not-for-profit formed in December 2014. We educate government, business and the community on accessible technology. We also research accessibility and lobby for law reform when it comes to accessibility of the technology we all use and enjoy everyday. People experiencing disability need and want access to these technologies, too! And the best thing is that it's not difficult for technology to be designed for access. The key is to think about acessibility in the early days of a product's development. We are creating an inclusive digital world by helping government, business and the wider community understand just how easy it is. To stay in the loop, follow us on twitter @egap_project, friend us on facebook or connect on LinkedIn with Gisele or Ted. Digital Gap Initiative has been invited to Canberra on World Usability Day to share our work with our politicians and others who have the power to ensure that this issue is addressed. We need to show them what it's like for a person who is blind, for example, to use websites and touch-screen payment devices whose design overlooks accessibility. About 1 in 5 Australians live with a disability. Accessibility is an incontrovertible issue for the agenda. The cost of sending the Initiative to Canberra and presenting at Parliament is $3,000, including (brochures, multimedia presentations, etc) and travel and accommodation for four of our key Committee Members and their guide dogs, D'artagnan and Princess Val. Any money raised over the $3,000 mark will help us to produce quality publications, brochures and audio-visual material for the event, and for future use. Please help us make this happen - donate now and/or invite your friends to do the same. 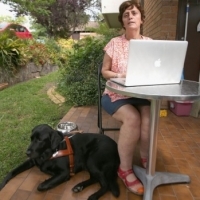 Join us as we take our message about digital inclusion for people experiencing disability to Canberra to mark World Usability Day on 12 November 2015.